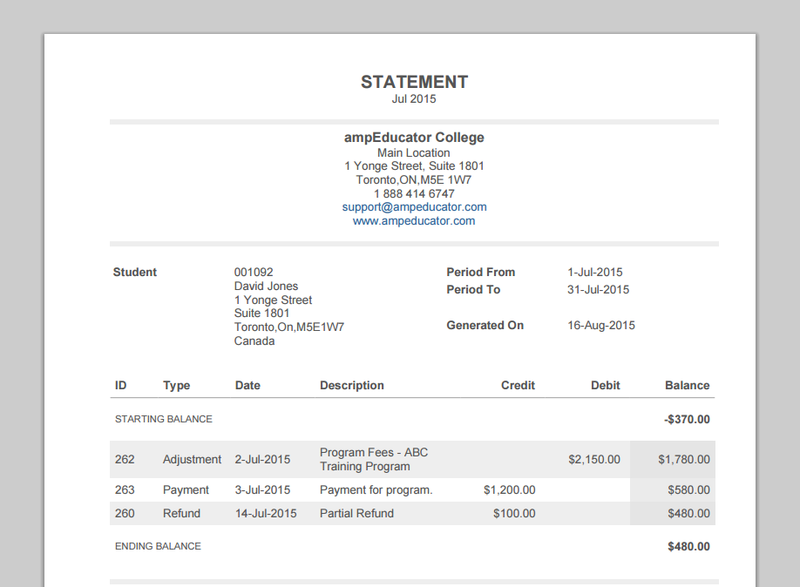 You can now import financial transaction data into ampEducator under Students->Import->Import Student Financial Transactions. This is part of our ongoing process to make import and export of data and simple as possible. We've made a lot of changes to student financials which are outlined below. We've replaced the single 'Amount' column in transactions with credit and debit columns making the transactions easier to read and bringing them into line with standard accounting practices. There is no extra work for the user as the application will automatically determine which transactions belong where. We've updated the format of statements and for receipts making them more suitable for emailing. We've had to remove the ability to assign a PDF template background. Statements can also now be automatically generated by month instead of date range. 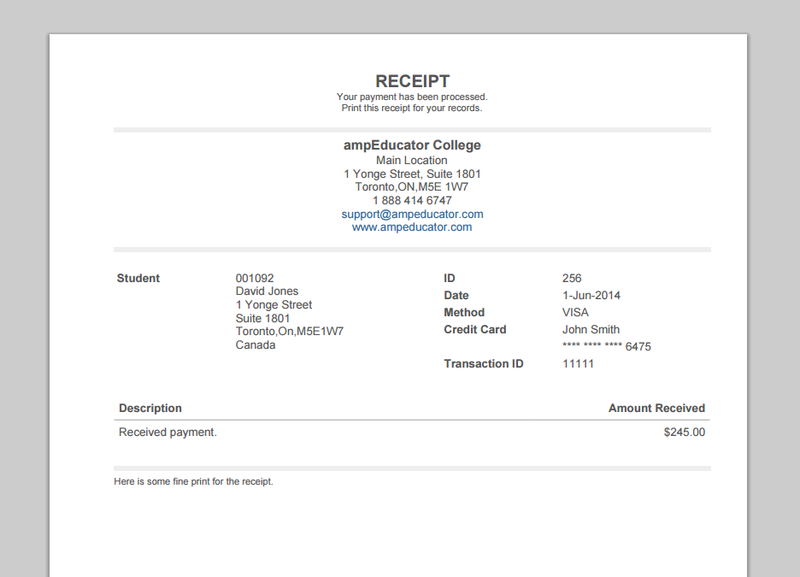 Receipts can be emailed directly to the student from the Student->Financial page while statements can be setup to be automatically emailed to students (with a balance) at the beginning of each month. The ability to manually charge fees for course, programs, academic years and other miscellaneous items is now available. We've added a special function for receiving funding instead of having it combined with the payment page. There is now an option to automatically refund course and program fees when students are withdrawn from them. 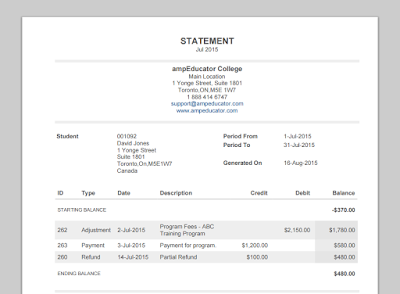 The student payment plan page has been updated slightly to make it easier to use. We've also added current payment plan balance in the student summary when viewing a student as well as a column in the student list. The student funding plan has been updated and simplified. We've also added current funding balance in the student summary when viewing a student as well as a column in the student list. We've removed financial groups altogether. You can now identify a financial account type as 'Tuition', 'Materials', 'Registration' or 'Other'. The information from financial groups was combined with existing financial accounts. 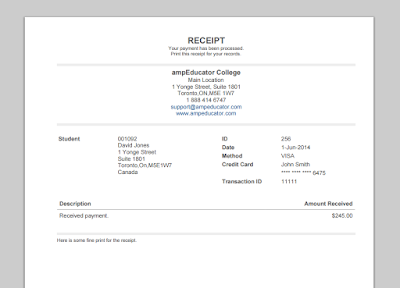 Students now have the ability to generate their own receipts and statements from within the student portal. If you have any questions, comments or concerns please email us support@ampeducator.com .